My blog, A Wondrous Portal Opened Wide. The "Missing Annotations" page looks at phenomena surrounding strange disappearances. The history of a secondary fantasy world from the ground up: The Fantasy World Project. Kolchak's coming back -- in style! "The Kolchak Papers". My latest bit of silliness: Reviving my fan-novel full of obscure Marvel Comics characters, Starwolf. It's official! Michael D. Winkle will be signing (and hopefully selling) copies of his book I Heard of That Somewhere at Gardner's Used Books, 4421 South Mingo Road, Tulsa, OK, from 10:00 AM to 5:00 PM on Saturday, April 13, 2019! Unless the signing is called due to Spontaneous Combustion or asteroid strikes. You never can tell in the weird world of Fortean phenomena. Out Now! 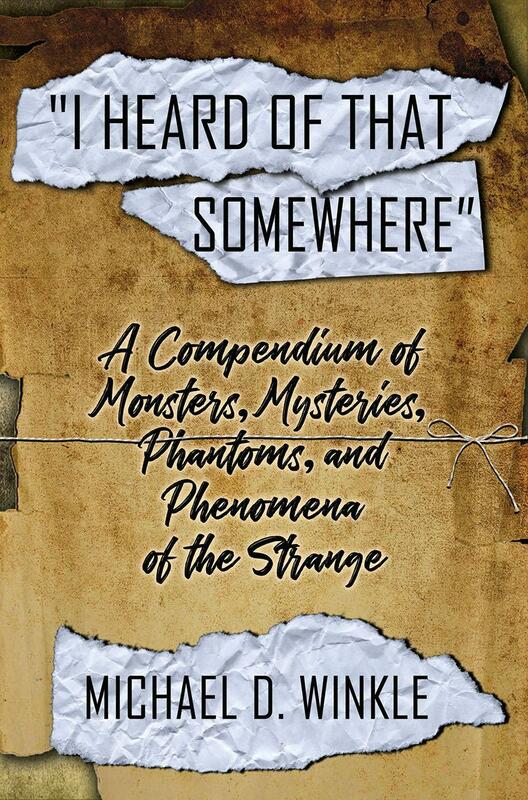 A compendium of strange events and true life mysteries, I Heard of That Somewhere! We've all heard of mysteries historical and paranormal; we've all discussed "true" tales at parties, around campfires, and at most other informal gatherings. We are all fascinated by strange, scary, and inexplicable events, yet when we collect them and pass them on, we forget basic facts concerning them. In I Heard of That Somewhere we trace famous and not-so-famous rumors, tall tales and urban legends to their origins, or as close as is feasible. Some old stories fade into fiction or hoax (though not as many as you might think). Others spread out in unexpected directions, bringing us to new, equally intriguing stories. Some actually become stranger the farther we search. And a few actually happened the way you heard of - somewhere. NOW AVAILABLE! The missing "key phrase/key word" index to I Heard of . . ., designed to help you track down those stories that are right on the tip of your tongue - yet elusive. Like "Mice flee house before death/disaster" and ""Flying wolf-headed humanoid!" Available Now! The first two volumes of the Ultimate Alpha trilogy! In Endangered Species: The Ultimate Alpha Volume One, the creators of a sci-fi/fantasy fanzine learn that the stories they print are not fiction! In the words of editor Chester W. Monday: "Werewolves? Chimeras? Battle arenas? A secret society that rules the world? A 'Possum Apocalypse?! 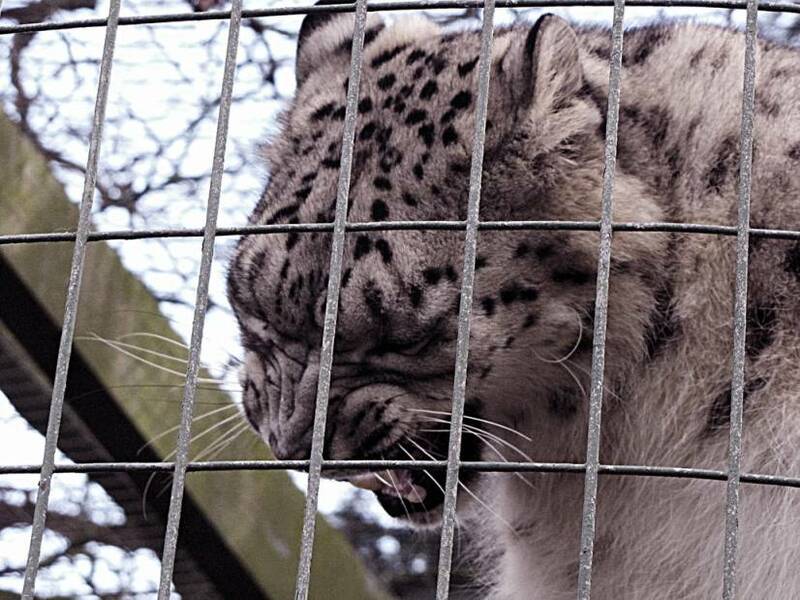 We just wanted to print entertaining stories, not make ourselves Endangered Species!" 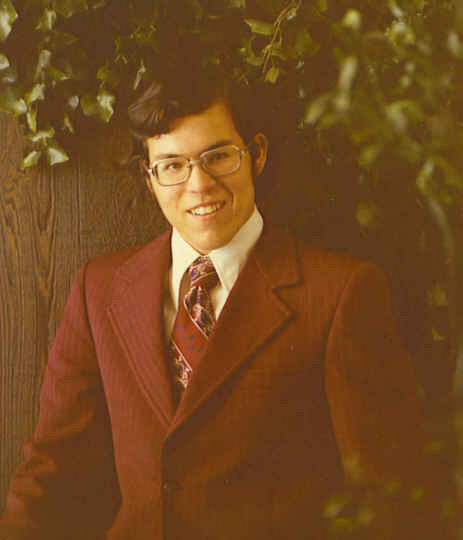 Two years ago Rex Gardner's sister Clarissa disappeared while studying cults for a college assignment. Now the EST-like organization D.R.I.V.E. kidnaps Rex himself. Clifford Warren, its charismatic leader, calls Rex the "Ultimate Alpha," a messiah of nature predicted by a pre-Atlantean civilization (with which D.R.I.V.E. has joined forces). The Ultimate Alpha is to draw Humanity and Nature together, heal the forests and seas and bring harmony to the world. 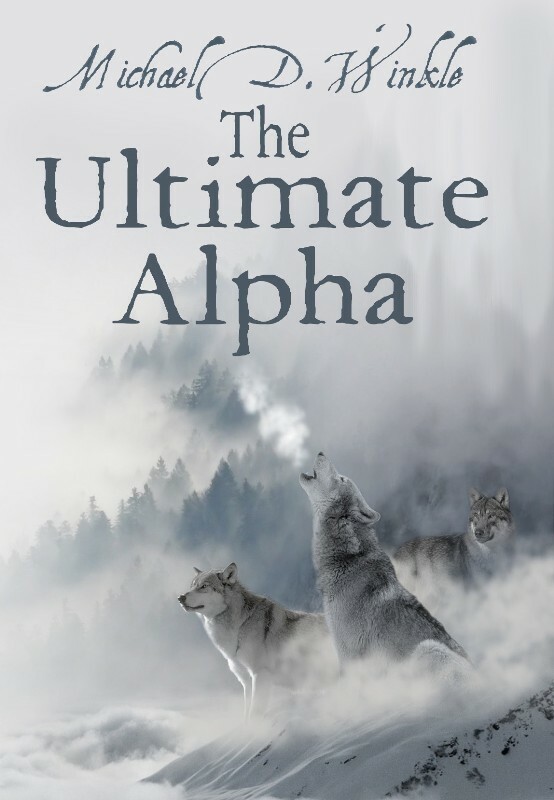 A laudable ambition, but before Rex can take the Alpha's mantle he must live as both man and beast. Thus he is transformed via a bloody ritual into a huge gray-white timber wolf. What can one person morphed into an inarticulate animal do against a secret society that has ruled the earth since the ice age? Find out in The Ultimate Alpha! Someday, somehow, we'll even churn out Volume Three of this shape-shifting saga, Alpha and Omega. When? Only the Great Wolf can say. You may have heard of West Virginia's red-eyed flying monster Mothman, but have you heard the whole story? Loren Coleman's Mothman: Evil Incarnate contains new information to fill out the Mothman saga, including a short bio of author John A. 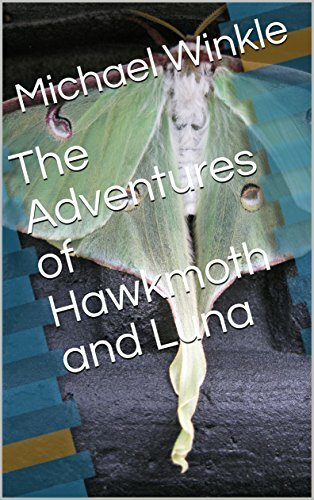 Keel, the story behind the 2002 movie starring Richard Gere (as well as various Mothman documentaries), the "Mothman Death Count," and an appendix, "The Mothman Annotations," by one Michael D. Winkle, which take up a full third of the book. Now we're getting somewhere! 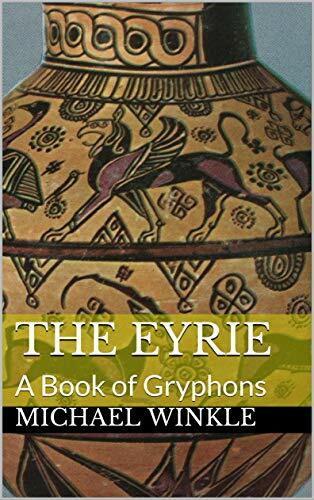 The Eyrie: A Book of Gryphons showcases several stories by yours truly featuring gryphons in one form or another, alternating with essays and trivia concerning this most fabulous of mythical creatures. Was there a second gryphon in Alice in Wonderland? What was strange about the gryphons decorating the Palace of Minos in Crete? You can see the eagle and the lion in a gryphon, but what third animal contributed part of itself to the flying beasts? I guess you'll just have to read The Eyrie to find out! Well, I finally took the plunge and joined Amazon Kindle. I have uploaded three books so far (two novels and a novella equivalent to 1/4 a book). I had to "translate" them into Kindle Create, re-review and re-edit them carefully, and learn new tricks of formatting, but after years of fruitlessly trying to catch the attention of agents and publishers, it was heartening to be able to do something constructive with them. Now I must polish up more novels (and perhaps a story collection or two) to display on Kindle. Then -- who knows? Actual, physical books may follow! 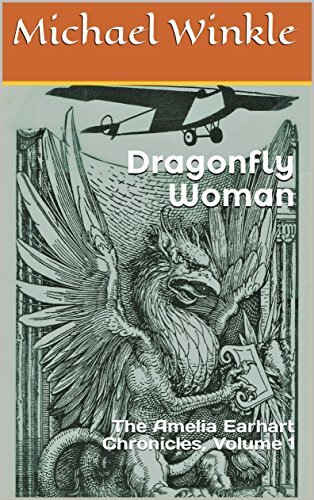 Dragonfly Woman, in which we find out the true fate of Amelia Earhart. 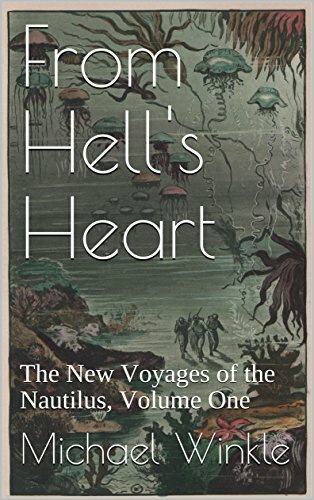 The latest is From Hell's Heart, the first of the New Adventures of the Nautilus. More will pop up in the future. And since I'm claiming so many are Volume One of a series -- I better start writing the sequels! Mothman: Evil Incarnate is out at last. Rather than cover the whole Mothman saga again, Loren Coleman adds to our knowledge of the events surrounding the weird cryptid of West Virginia. At last we learn some details about author John Keel's life. We go behind the scenes of the Richard Gere Mothman Prophecies movie. And we are brought right up to the present with a chapter concerning the recent Chicago Mothman sightings. Has Point Pleasant's pop-eyed pterodactyl flown west? Only time will tell! My own contributions to M:EI, "The Mothman Annotations," make up a full third of the book! And the bibliography remains intact -- if I couldn't cram in my sources, I could hardly complain about fortean books rarely showing sources, could I? So head on over to the International Cryptzoology Museumfor M:EI and other anomalous books and items! What else ya gonna do with that Christmas money Uncle Larry gave you? 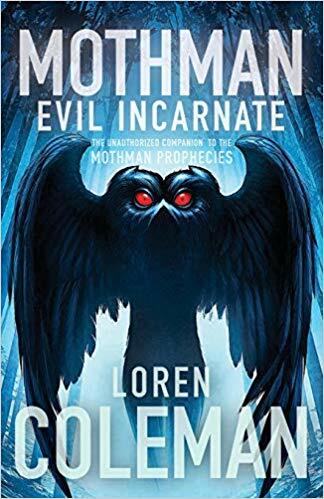 At long last, Mothman: Evil Inarnate by Loren Coleman (and with my 15,000-or-so word Annotations at the end) is coming out! Pre-order your copy today! I've always wanted to write a novel about monster-chasing journalist Carl Kolchak, but who has the time? I've also always wanted to write a novel about the notorious Jack the Ripper. Then one day it occurred to me I could have both, with half the effort. So here is Part One of The Kolchak Papers: The Ripper, from a screenplay by Rudolph Borchert, with characters created by Jeff Rice, and with assorted added scenes to build it up to novel length. I think, just for fun, I will upload an Indiana Jones fan story from several years back, "Young Indiana Jones and the Curse of the Night Walker". Part of the old material that's been bubbling up recently, as I explain below. Having read tons of literature about cults, movements, organizations, and belief-systems that accept the most bizarre and absurd concepts, I sometimes feel a wee bit superior to the masses who flock to such sociological attractors. However, about a month ago I fell for an Internet scam hook, line, and sinker. It was a humbling experience. Bank account drained, two credit cards compromised; I changed passwords, card numbers, emails, across the board. For two weeks I had my computer in the shop to have malware removed and firewalls installed. Anyway, one consequence of this forced shutdown was that I had little better to do than to dig out my old, moldering manuscripts and read them over. Many writers who do this cringe at how badly they wrote "back then." My reaction, however, was that these old stories and novels were much better than I recalled. How could I have just let them pile up without trying to market them more?!? With computer restored now, I've been working on updating old material as well as writing new tales. It's like I've had a way-overdue burst of energy, interest, and enthusiasm. Almost makes getting scammed worth it. Almost. I may have an actual printed-type book coming out this year! I know you're all dying to know about it, but let's hold off celebrating until there's more definite news. No need to tempt Fate . . .
For you poetry lovers out there, my sequel to Robert Browning's "The Pied Piper of Hamelin," "A Wondrous Portal Opened Wide," appears in Illumen no. 26 (Winter 2017), from Alban Lake Publishing. Strange and frightening things have happened in Wisconsin over the years. Are they events of happenstance, or could they be related? See The Convenient Madman. Though I prefer this one, taken . . . at some point in the past. David Paulides' latest book, Missing 411: Hunters, and the recent podcasts referring to it, touch upon a frightening phenomenon: sightings of "something" that is almost but not quite invisible, like the alien hunter of the Predator movies. If you have checked out my "Missing Annotations" page any time in the past year and a half, specifically the sub-page entitled "Damned Things", you would know that people have been -- not seeing, but experiencing -- unseen "things" wandering around North America for over a century. Remember, you read it here first! Seeing how this site is called The Fantasy World Project, it's high time said fantasy world saw print. Finally a story set in the world of Aanuu has come out between two covers, in the anthology Gods with Fur. "Origins", appropriately, tells us how the civilizations, races, creatures, and gods of Aanuu came to be. Well, stories are out, but editors hold them for longer and longer periods, it seems (unless they say "NO" almost by reply email). For what it's worth, I won third place in Ann and Dan's Very Short Story Contest (about halfway down the page). The front porch swing carried many memories on its slatted maple seat. Grandpa painted it an odd shade of green, a light chartreuse that eventually became simply "the swing color." On it Grandma and I sang "I've Been Working on the Railroad" as Southern Pacific cars thundered by only a few yards away. Plastic army men fought and died upon the stage of its wooden seat, and it served as both prop and set to my brother, the amateur filmmaker. One spring, as we discovered to our dismay, the swing provided scaffolding for mud dauber wasps. Red clay high-rises, hard as brick, covered the huge eyelets screwed into the porch roof. They even cemented over the support chains. A real war raged that summer for possession of the swing, a battle repeated every June thereafter. The inevitable collapse came, startling and swift, beneath my teenage behind. Grandpa installed another swing, but it was never as comfortable or sturdy -- or loving -- as Grandma's original. She is many years gone, but I envision her seated on it still, swinging through golden clouds: "Someone's in the kitchen with Dinah . . ."
Well, the great re-editing and mailing of stories continues. Approximately one story is ready per week. Better than, say, 2009, in which I don't think I sent out more than 7 or 8 stories altogether! (Best not to think of that era). Also, I've re-posted and updated The New, Improved Eyrie, the newsletter about gryphons. I still need a few illustrations; then, maybe, after all these years, I can work on a new issue! Work continues on what may be the most episodic novel of all time, Fanzine. Just a few more stories/ chapters to go . . . at least three other novels demand attention, and two finished projects search for an agent. All that plus who knows how many stories and articles that need polishing and submitting, and I'd like to take some college classes this semester, as well! I may not post often here or on my blog, but if I don't get work published, there's not much point in having a web site to begin with! Chester: We need more illustrations, a guestbook or comment area, and updates everywhere! How will we hold people's interest until we get the Fantasy World Project running again? M: Well, visitors might check out our pages of annotations and comments concerning the Missing 411 series. The strange disappearances of human beings described by David Paulides' books brings to mind other phenomena that one might not normally associate with missing persons -- so we'll take a look at those. Or our viewers might look over interesting books to be found at Amazon -- like Tales of the Witch World 3, a shared world anthology about, as you might guess, Andre Norton's Witch World fantasy series. Or Panverse 2, edited by Dario Ciriello, an anthology of those hard-to-place literary wonders, the novellas. Then there's Tom English's thick anthology, Bound for Evil, full of tales of eldritch, magical, or cursed tomes, with authors ranging from grand masters of horror to modern newcomers. Or they might wish to look over intriguing magazines, like Necrotic Tissue. However, it might not be so bad if they left this site for certain others, such as The Journal of Unusual Entomology, or Specklit. Chester: . . . Because we have stories in all of the above, right? M: By some curious coincidence, yes. Recently I looked over my apartment -- which is dominated by stacks of paper three feet high -- and decided to tidy up or else. So I snatched papers at random from a pile. They happened to belong to a story I'd written called "Sundown Syndrome," which I hadn't looked at since 1998 or so. I decided it was a good story, after all, and set it aside to review/edit/clean up. Then I pulled out more papers at random. These proved to be a story called "In Your Own Back Yard," which seemed good, though ignored for several years. Then I pulled out an old effort called "The Lincoln Paradox," and that looked good. After a couple more stories popped out, I forgot about cleaning up papers -- I'm going to be busy reading, re-typing, editing, and sending out the forgotten tales. Meanwhile: I purchased the domain name "fantasyworldproject", so I'd best get on with the fantasy world. Such a millieu implies fantasy creatures to inhabit such a world, and in this one the half-lion, half-bird Gryphons will appear prominently. I even had an occasional newsletter devoted to Gryphons, but when Geocities dropped free hosting, I allowed it to fade into cyberspace. Now, however, The New, Improved Eyrie will slowly appear in the Fantasy World Project. Only the first issue for now, but others will certainly follow! Earlier this year I decided to write a story for an anthology concerning the fabulous flying monster, "Mothman". The upper limit was 3,000 words. My story, so far, is at least novelette length, and if I don't put on the brakes, might reach "short novel." I started a second story, much shorter -- but still half again as long as the limit. So I typed it, printed it, and spent a week cutting it word by word. I think I succeeded, and the experience of having a deadline (June 1) spurred me on. As usual, chugging along on those stories made me want to work on other projects. For instance, I finally decided to dig out and clean up my old web-page, The Kolchak Papers, dedicated to the monster-chasing character Carl Kolchak from the Night Stalker films and series. Then, reviewing my dozens of old, pen-scribbled notebooks, I found untyped stories that I'd completely forgotten -- and, at the risk of sounding immodest, that I think are pretty well-written. So my plate is getting full with these new projects. Now if I can just get my energy going on the Fantasy World Project! Oh, well, as I slowly finish one, I can set it aside and start on another. Eventually the Project will grow again, along with its associate stories. Well, slowly but surely the writing returns. After a long delay, Panverse Two appeared with my novella "The Curious Adventure of the Jersey Devil." It resulted in some good reviews, including one from Gardner Dozois in LOCUS (Nov. 2010). On December 29, 2010, the e-zine Eschatology printed "Sudoku Tako", a Lovecraftian short. And recently the upcoming anthology Mondo Sasquatch (obviously a quality publication) accepted "Strike". Now to work on those stubborn novels! The Monster slogged tirelessly across the pack ice. "I do not forget my vow to immolate myself, Victor Frankenstein," he muttered, "but firewood is scarce in this frozen clime." He huffed a thundercloud of breath and marched on, hearing only the crunch of snow and the howl of wind. Here, at the top of the world, he could wander unchallenged and unfeared, but only because no one lived here to object. "Perhaps it was you, not the Almighty, who made me, Victor," he said to the black sky, "but I prayed for so long that there might be a place for me somewhere in God's creation." Ahead the jagged peaks of a small island rose over the ice. Tiny flames crackled on the shore. Intrigued, the Monster approached. Small creatures huddled around the fire. Some resembled animals up on their hind legs. Some resembled children with malformed heads and limbs. Stitches lined their bodies as if each one had been sewn together -- badly. "Oh!" exclaimed a girl with red yarn for hair. "You're the biggest dolly I've ever seen. You must be a misfit!" A bear with the incongruous fan-tail of a peacock ambled up. "If you're a misfit, you're welcome here." A winged form passed overhead, backlit by the wavering aurorae. It was no bird, but a regal hunting beast. On October 21, 2010, after years of fighting cancer, congenital heart failure, and Alzheimer's, my father, Donald W. Winkle, passed away. Don's health problems began nearly a decade ago, when it was determined that he needed triple bypass surgery. He has been in and out of hospitals ever since. Anesthesia and drugs never seemed to affect him as they were supposed to, and he learned to hate the doctors and hospitals stays -- I can't say I blame him. Don's increasing physical and mental problems were hard on everyone close to him, particularly so on his wife of 37 years, Sharon Stewart Winkle. The end came with shocking swiftness. One weekend he was still quite active and talkative; two weeks later he all but stopped speaking, spending his time simply wandering around the house and yard. A week after that he collapsed, having literally (according to the hospice nurses) forgotten how to walk. A few days later, his pulse, blood pressure, and respiration simply grew weaker and weaker until they ceased altogether. Donald Winkle was interred in Bixby Cemetery, Bixby, Oklahoma on Monday, October 25, 2010. Well, more time seems to pass through my fingers. The past nine years have been so messed up, I'm beginning to believe it was all part of a cosmic learning process, of the tough love/sink-or-swim variety. Okay, I've learned my lesson, so it's time to press on. I don't want to tempt Fate, however, so I'll begin with something easy -- say, a list of my printed works down at the bottom of the page (way overdue, anyway). Well, possibly it's not a new decade yet, as 2000 was not really the start of the new millennium, but it's good enough for a new beginning. Don't you hate when you're behind some slowpokes on the highway, and you decide to pass them, and suddenly they decide to speed up when you're not quite past? Maybe they decided they were, indeed, going too slow -- maybe they hope a truck will roar up and smash you off the road. It's just annoying. When I was 17 or so, I stayed up late to see the Spanish "Count Dracula" starring Christopher Lee. No, not the Spanish version of Dracula, or Lee's "Horror of Dracula." This early 70s effort was very faithful to Stoker's novel (down to the bushy gray 'stache Lee had), but it was also the slowest and most boring film I ever saw. Still, I lay down in the living room and watched. But I kept hearing things from the garage. Eventually I thought I heard noises from the attic, overhead, as well. I flipped on the garage light (from inside) and peeked through the little, distorting peephole that happened to be in the door leading to the garage. The pull-down ladder that led to the attic was down. I didn't recall it being there earlier. I wondered if someone could be in the attic. I think I opened the garage door, but I didn't step out or call "Hello? ", thinking, why attract attention? (Though merely turning on the light would have shown that someone downstairs was at least suspicious.) The noises continued, noticeable enough that I peeked out a few more times. I continue watching Dracula, but instead of stretched out before the tube in proper Monster Kid fashion, I wandered around the living room, bouncing on the balls of my feet, as if I'd have to run. And I kept hearing noises. I turned down the sound during a commercial. The sounds from above were a soft, continuous creeek-crick-crack-creek-tik-crack, which seemed to me the sound something might make if pressure were being put to it until it was ready to break. I studied the ceiling where I thought the noise was coming from. There were long, tiny cracks in the gypsum drywall (or whatever the ceiling was made of), some running from wall to wall! It looked like something was about to crash through into the house! My dad was always warning us that only in certain parts of the attic could someone stand safely; step in the wrong area and down you'd go through the drywall. Naturally, I decided that a drooling maniac was in the attic, and, unknowledgeable about the weak spots, he was going to crash in on me! Yet I stood (off to the side), my attention divided between the TV and the ceiling, rather than calling 911 or something (I was terribly introverted and would have truly had to be in danger to actually bother the cops). "Count Dracula" was long as well as boring, and as the night wore on, the noises faded. I convinced myself that the cracks in the ceiling had always been there, I just never had reason to notice them, and that the ladder had indeed been down earlier. Finally I went to bed -- but with one eye (and ear) alert for any crashing noises. Well, I'm in the middle of moving, so there's not much time to devote to the web page. Everyone seems to have a blog these days, and some people manage to write in something every day! Don't know how they find the time. Looking back on the past few years, it doesn't seem to have been that busy. They have been tense, however, and I found myself unable to concentrate on writing, taking classes, or anything else. The activity of putting things in storage, disposing of unnecessary items, and packing up gets me going, however, and I'll try to keep going. It's odd that action seems to beget action; you'd think you'd have less time to write, read, study, and network if you have more physical tasks to accomplish. Newton's laws affect more than just objects floating in space, it seems. Moving to a new (and bigger -- and better-looking) place also feels like a new beginning. A fresh start, a fresh approach, and extra Vitamin D -- look out, world! I never used the option to have the Project put on search engines because I knew from the beginning it would be very slow in its creation -- and that was back when I was burning with inspiration. However, the links from Troy Taylor's "Ghosts of the Prairie" site have resulted in numerous hits, so I may just have to update the FWP. Away Down the Road a Piece. 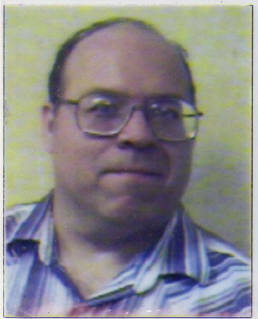 It's been nearly ten years since I connected to the Internet and created my first crude web-pages. In some ways the time seems to have passed like a snap of the fingers, and in other ways that decade feels more like a century. It was not an enjoyable era in many ways. Almost annually some Life Problem arose that absorbed all my time and energy, tossing me aside after a while like a wrung-out dishrag -- only to be replaced by a new Life Problem ten times worse than the one before. Even if the new disaster didn't roar up immediately, it took months to recover emotionally and spiritually. I believe it is time for me to put a stop to that. This web site is called the Fantasy World Project. I expected it to develop in private, away from my old page (Fiction and Reality), but Geocities' decision to shut down their free hosting spurred me on to updating/improving/transferring everything here. Not every file and page from F&R will make the jump, but what does ought to look a bit more professional. Obviously, I'm dedicating a large part of my bandwidth to "The Fantasy World Project." After years of writing SF and fantasy, it struck me (on June 10, 2006, to be precise) that I could trace almost every character, creature, fantasy name, and storyline back to its original inspiration. I've seen other authors' maps, fantasy histories, and indices of people and things, but nothing on the scale of which I was thinking. Why not? The Project took up a lot of time, but it was fun and inspiring in its own right. Of course, I labored under the belief that the Bad Times were over at last -- when in fact the next few years would get even worse. I've decided that I have to make conscious decisions to get out of life's little quicksand pits. One of these decisions is to re-boot the FWP. I worked on it in 2006, created the web site in 2008, and now -- well, third time's the charm. Besides, charting the old inspirations will bring to the public's eye the titles of many authors, books, and journals that languish in old libraries. Perhaps others will dig them out, even in this Twitter and i-Phone world, and find inspirations of their own. Page One of the FWP. Meanwhile, I'll start polishing up my old pages, such as the Eyrie (gryphon newsletter), the Kolchak: the Night Stalker page, and others. In the real world, I'm also writing more legitimate stories, taking night classes, and working full-time, but -- hey, it's fun! 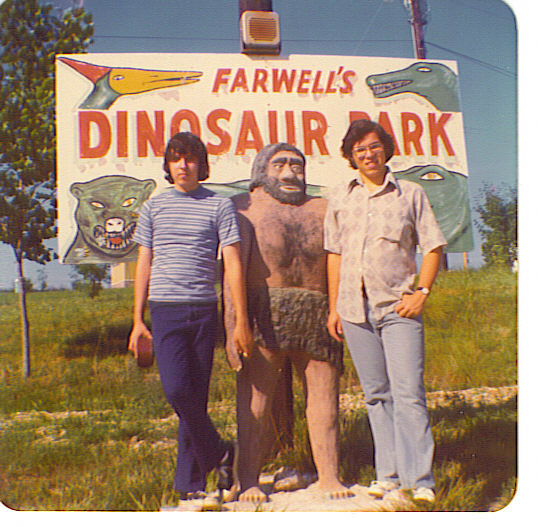 The author at the Dinosaur Park in Arkansas. One of the fellows on my right is my brother. That's a nice broad title. I could add updates here for months. AUGUST: I watched the old SF film X -- The Unknown a couple of years ago and saw bits that had to have inspired Monty Python's Flying Circus. When people are shown facing the camera (and the radioactive blob from the earth's core), they scream and sink out of view (melted by the monster). If you ever see the movie, be sure to yell, "AAAH! The Blancmange!" at these parts -- referring, of course, to the "Blancmanges of Andromeda" in the "Science Fiction Sketch." Another scene, of a scientist being lowered into a fissure in the earth's crust reminds me of a scene in which some stuffy British Secretary for something-or-other falls through the earth's crust. . . I bought a video of Hammer Film's The Lost Continent, which came out only a year or two before the first season of MPFC. The video contains the original theatrical previews, and the previews alone seem to be the major inspiration for "Scott of the Antarctic," with the bizarre Sargasso Sea monsters menacing the beautiful women aboard the stranded ship. The slobbering, blocky giant crab is a dead-ringer for the Man-Eating Roll-Top Writing Desk. There is another major influence in the movie: The ship gets trapped in the Sargasso Sea, the crew sees funky monsters and man-eating sea-weed, and at the center of this unearthly realm, what do they find? THE SPANISH INQUISITION! And only a couple of weeks ago I found any number of Pythonic influences in a single episode of The Avengers, an early one featuring Honor Blackman as Cathy Gale, entitled "The Little Wonders." It's about an organization of criminals who masquerade as priests. A padre caught at an airport with guns, knives, secret compartments in his luggage and stolen pearls in his clerical collar reminded me of Eric Idle as a priest at an airport in MPFC. A thug in a "doll hospital" looks exactly like Michael Palin's Mr. Liugi Vercotti, down to the wrap-around sunglasses and ever-present cigarette. And the muscular, scarred, thug-like ministers are very reminiscent of the ones seen in "The Bishop," and indeed one fellow is called simply "Da Bishop" throughout the episode. Favorite Book: The Wild by Whitley Strieber. Favorite Short Story: "Kaleidoscope", "The Fog-Horn," "The Crowd," "A Sound of Thunder," or "Mars is Heaven! ", but it's definitely by Ray Bradbury. Favorite Poem: "The Pied Piper of Hamelin" by Robert Browning. Favorite Vignette: "I Can't Claim That" by Manly Wade Wellman. Favorite Album: Fantasy Film Worlds of Bernard Herrmann. Favorite Song: "Radar Love" by Golden Earring. Favorite Magazine (single issue): Fortean Times no. 40 (Summer 1983). Favorite Magazine (in general): the late Uncle Forry's Famous Monsters of Filmland. Favorite Radio Program: Thistle & Shamrock on National Public Radio. Favorite Map: Indians of North America from National Geographic, December 1972. Favorite objet d'art: the Kitsune (White Fox) statuette that came from someplace called Wony, Ltd., in Italy. Favorite Cartoon Short: that epic meeting between Bugs Bunny and Wile E. Coyote, "Operation: Rabbit". Favorite Comic Strip: From kindergarten to the present day, I'd still say Peanuts by Charles Schulz. Favorite Comic[s]: Marvel Premiere 45-46, containing the quintessential Man-Wolf tale. Favorite Mythical Creature: the Gryphon! "Typo": Fantasy Book #23, March, 1987. ---- Reprinted in Cthulhu's Heirs (Chaosium, 1994), edited by Thomas M. K. Stratman. 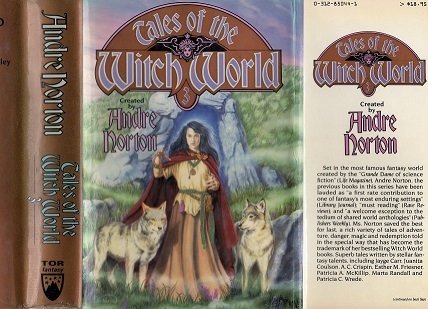 "Wolfhead": Tales of the Witch World 3 (TOR, 1990), edited by Andre Norton. "Old As You Feel": Amazing Stories 68:7, October 1993. "Landscapes": Marion Zimmer Bradley's Fantasy Magazine #21, Fall 1993. "Future History": Pirate Writings 2:3, Summer 1995. "Toon-Boy": Going Postal (Space & Time, 1998),edited by Gerard Houarner. "The Humblest Things": Would That it Were 2:2, April-June 2001. "Victims": deathlings.com #10, Summer/Fall 2003. "This story grabbed us by the throat and didn't let go until the very end." -- Editorial, deathlings.com #10. "The Autumn Beast": Here & Now #5/6, Spring 2005. "Drabble #2 (An Embarrassment of Rippers)": Farthing SF, Fantasy and Horror #1, July 2005. "Drabble #3 (Their Voices Are Heard)": Farthing #1, July 2005. "Life-Form": Flashshot August 18, 2006. "The Book of Cain": Bound for Evil (Dead Letter Press, 2008), edited by Tom English. "Mental": Glimmerglass Vol. 1 (Bookemon, 2009), edited by John Small. "Curious Adventure of the Jersey Devil": Panverse 2 (Panverse Publishing, 2010), edited by Dario Ciriello. "Sudoku Tako": Journal of Eschatology (December 2010). "Mimsy": Necrotic Tissue 14 (April 2011). "In Your Own Back Yard": Journal of Unlikely Entomology no. 4 (Nov. 2012). "Electronic Voice Phenomena": Speclit, July 5, 2014. "Revisionist": Speclit, July 31, 2014. "Origins": Gods with Fur (FurPlanet Productions, 2016), edited by Fred Patten. "A Wondrous Portal Opened Wide": Illumen no. 26 (Winter 2017). "Hoodies and Horses": Dogs of War (FurPlanet Productions, 2017), edited by Fred Patten. "After the Matilda Briggs Went Down": Orson Scott Card's Intergalactic Medicine Show (July 2017). "The Cthulhu Mythos": Scream Factory #7 - #9, Summer 1991 - Summer 1992. "The Lost Notebook of Diedrich Knickerbocker": The Unspeakable Oath #11, Fall 1994. "Formidable Visitants": Dragon Magazine #252, October 1998. "Hoodwinks": Anomalist #10, March 2002. "H. G. Wells' War of the Worlds": The First Line 7:1, Spring 2005. Manly Wade Wellman's Silver John: "Away Down the Road A Piece" and "Moon-Eyes"
A page dedicated to Carl Kolchak from The Night Stalker: "The Kolchak Papers", wherein can be found "A Stranger in a Bar" and "Auld Lang Syne"
A page dedicated to Whitley Strieber's The Wild, which leads to "The Hunter is High"
Can't forget a certain adventurous archeologist (herein still a Boy Scout) "Young Indiana Jones and the Curse of the Night Walker"
Once again, Page One of the FWP. Gryphons get their own spot: The New, Improved Eyrie! We welcome your comments and observations. E-mail the FWP!